As we came back from Top Slip and Parambikulam, we told the lodge guys that we would be vacating next morning and head to Vaalparai. We packed our things (read, putting everything you find in to a bag) and slept early so that we could catch the first bus next morning. We got to know that the first bus is at 7.15 types, but we missed it even though we were at the bus stand on time. After 30 minutes wait or so, we got in to a bus and we could just get the last two seats in the bus. I am not sure why every other bus gets crowded there. Rukku said he would get something to eat and went down. While he stepped down itself I had a hunch saying how would the conductor and driver would react if I ask them to stop while Rukku returns. And that exactly happened in few minutes and the conductor was about to loose his patience. But just then Rukku stepped in and we were off to Vaalparai. I was relieved for two reasons, one was we didn’t get much of the shouting from the bus guys. Secondly, we had something to eat :D.
Well, Vaalparai is about 45KMs from Pollachi and the best part is its an uphill climb. Like you got to cross some 40 hair-pin bends and we were quite excited about the climb. We just asked the guys sitting next to us to give us some room so that we could get to see some of the view from the top as the bus took some great turns in the hair-pin bends. 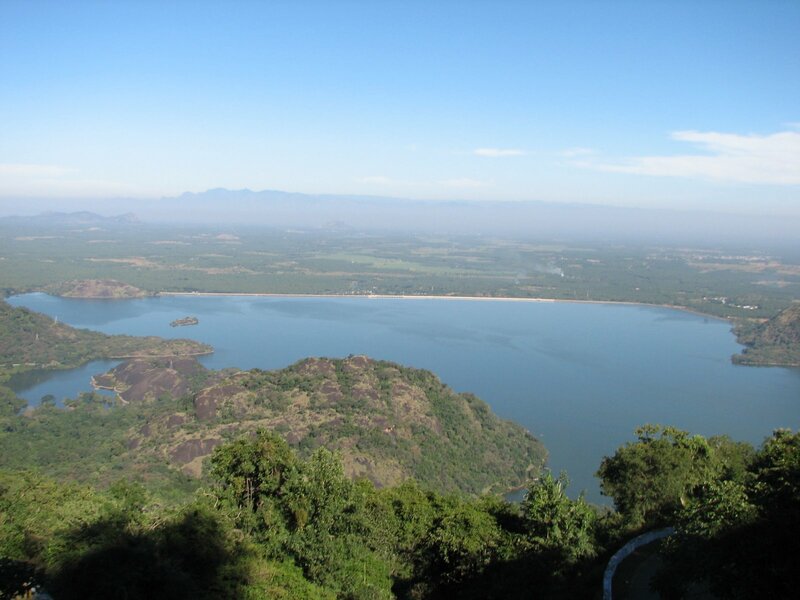 We could see the Azhiyar dam from the top and it was such a wonderful view from the top. Now, another lesson here is we shouldn’t use public transport for everything. If we had come by a car or something, we could stop at some view points during this uphill climb, spend some time and enjoy the scenery. Well, things like this were noted down in our memory so that next time we make it a real good trip. 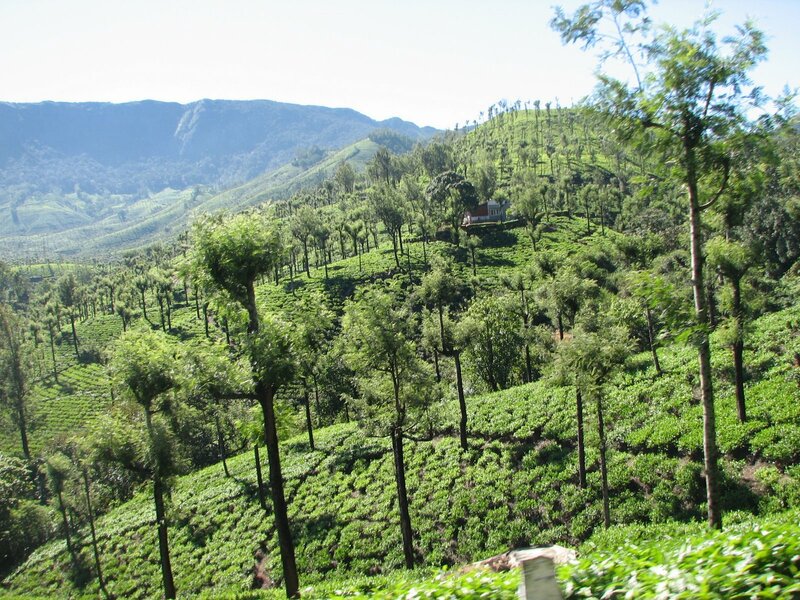 As we crossed all the hair pin bends, we got in to the Vaalparai town and wow it was just tea estates everywhere. Tea and Coffee plantations are the only source of income in this town I guess. There were so many of them and each of the estates had some tall trees amongst the tea plantation. We didn’t know why they grow them too, but the conductor clarified saying that those trees are actually for absorbing the water from the ground. Like, the tea plants cant take a lot of water it seems, and these trees would absorb some of the water so that the tea plants don’t die of excess water. We got down at the bus stand and got in to a hotel room near to the bus stand. It was for only one night and we just took a double room. We put down our bags there and immediately came back to the bus stand to board a bus to “Solaiyar Dam”. We heard that apart from the estates, there is this dam and another Balaji temple as the tourists spots there. We weren’t interested in the temple so we went to the dam. It wasn’t such a great dam, as such the dam was closed due to some maintenance work. When we inquired, we came to know that the dam has served its life and is about to break down in 3-4years. It would either fall down on its own, or the govt guys got to bring it down. So there was this work to strengthen the dam. We just sat down there for some time and then started to look out for some food. There was one small hotel kinds near to the bus stop itself and we had our food there. The rasam they served us, I still can recollect the taste of it. I think that’s the best rasam I had till now… 🙂 After the food and little bit of wandering here and there, we boarded the bus to go back to Vaalparai. We had to go for a wedding of one of Rukku’s friends. After 10 minutes or so, some smoke was coming out of the bus near rear tyres. 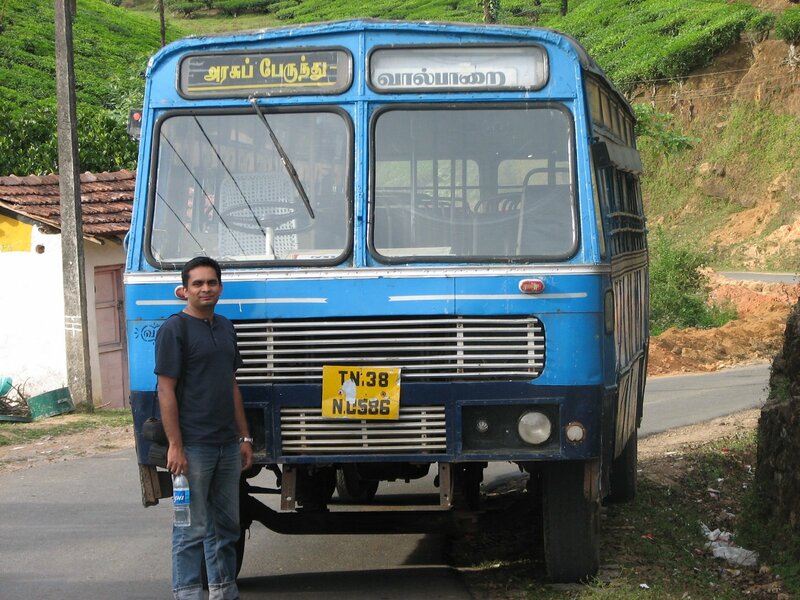 The driver tried his best to get us back to Vaalparai, but on the way there was a road block. One truck with full load of logs had broken down right in the center of the road and vehicles cannot cross the truck and we were struck. Every one started to get down and we also got down thinking that we should help the guys to move the truck aside so that the traffic can flow through. So we went and started to push the truck with full enthu and somehow some 10 of us with local fellows managed to move the truck to the side of the road. We turned back thinking that we did something good, only to find that those who had got down with us actually got down to board the bus that was standing before our bus and they had moved. Well…well…no comments…the driver told us to go in that bus warning us that this bus would move very slowly. We decided to go in this bus only and enjoy the ride (A bus only for two of us). We stopped in between, had some tea and clicked some pics too!!! We were chatting with the driver throughout the journey and asked him to get us down say about 3 KMs before Vaalparai. He got us down and the remaining 3KMs we walked in the tea estates. That was the best part of the day as we went through the tea estates with a cold breeze and you could just walk like that any distance. Just before we entered Vaalparai, the driver who dropped us down was waving his hands as he took the next trip, of course in a different bus this time. After reaching Vaalaparai, we got tried to get the phone number of Rukku’s friend so that we could ask him the direction and all. But we weren’t able to get it. But we decided to go ahead with the information we had and took a taxi to reach that place. 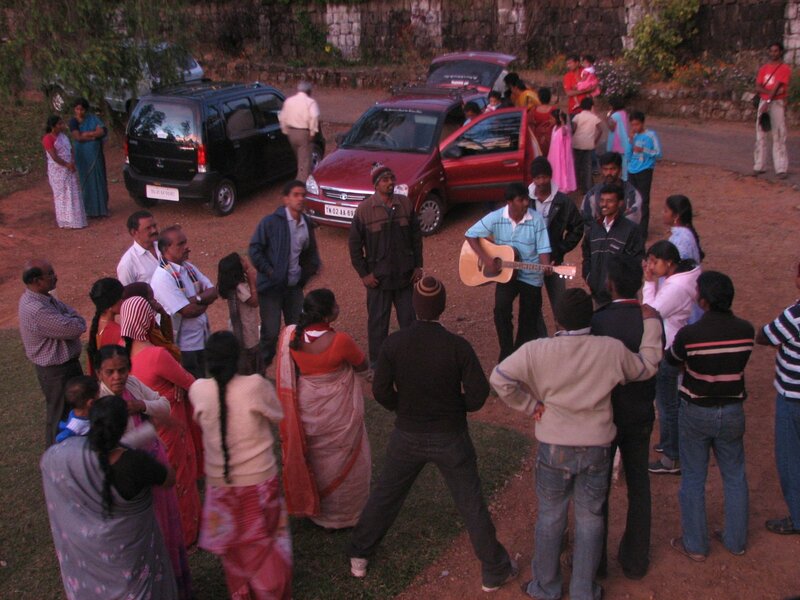 We reached the correct place as we could see Rukku’s friend there… 🙂 It was a Christian wedding and they had formed a group and were singing songs in praise of the lord. It was a good evening as the night fell down we could feel the cold. It was actually a sports club kinds where the employees of Tata Estate can host their functions too!!! We spent some time there and heard stories on how a Cheetah was spotted last evening just near this sport club where it took away one calf!!! In fact we were frequently walking to the entrance of the club which is about 200m from the club in pitch dark. We didn’t come out after hearing that story!! !